Whether you’re handling a wild snake for relocation or simply holding your beloved pet at home, protection is key when dealing with snakes. These slithering creatures possess the means to inflict massive pain and potential death in humans, depending on the species. Even if a snake isn’t venomous, their sharp fangs can still cause some serious damage. In addition to high-quality protective gaiters and snake proof boots, gloves are a worthy investment whenever you’re dealing with snakes. 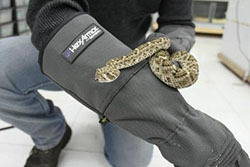 Snake bite-proof gloves make it possible to handle snakes by hand without the worry of harm. They utilize thick material that’s resistant to even the smallest puncture. Instead of giving in, the material creates a tough barrier to keep your fingers and hands safe from harm. It also makes it possible to handle the snake with confidence, which will ultimately make the experience easier on them. 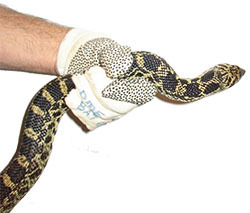 A high-quality pair of gloves can help to keep you safe while making the snake feel at ease. There are a number of options available on the market with some designed with specific needs in mind. Here are 5 of the best snake bite-proof gloves to keep you safe. 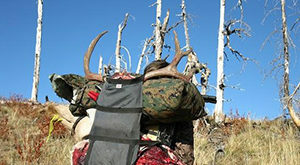 HexArmor is a leading manufacturer of safety gear. The Hercules 400R6E is no different. It utilizes a unique material called Super Fabric. This material is synthetic and features minuscule armor plates. They are woven tightly together to create a cut and puncture-resistant final product. The gloves are covered with this fabric on the palm and back of the hand. The palm also has improved grip on dry objects. It’s also curved for better flexibility. To ensure that your entire hand is protected, the gloves feature a gauntlet that extends past the wrist. 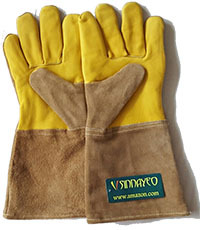 These gloves from Vet-Pro are made from a combination of natural and synthetic materials. Top grain Palomino cowhide is used throughout. It’s backed by a double layer of Kevlar on the fingers, hand, and cuffs. This combination of materials prevents punctures by sharp objects and teeth. To hold the various materials together, the glove uses an in-stitch method of construction that utilizes 100% Kevlar thread. This ensures that the gloves won’t be torn apart or damaged. Snakes protection also extends far beyond the fingers and hand. The cuff measures roughly 21 inches in length, offering maximum protection to the wrists and forearm. These tough gloves are a must-have for anyone that wants to protect their entire arm. While other gloves typically have a longer cuff to cover the wrist, these gloves are very lengthy and can extend up to the bicep. They’re made predominantly from durable cowhide. The natural material is tough and resistant to punctures. Inside is a thick non-woven fabric for extra protection. The two layers are sewn together using thick reinforced stitching. Overall, the gloves are a solid way to keep your hands protected from bites. 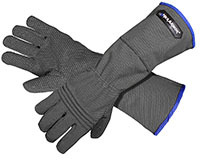 Furthermore, the gloves are heat resistant and breathable for comfort and versatility. 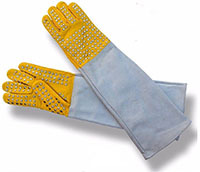 Utilizing steel studs to create a protective barrier from bites, these gloves are certainly a unique option. Most of the gloves are made from leather. The thick leather does a great job at blocking small teeth from puncturing the glove. However, for even more protection, the hands and fingers are covered in robust stapled studs. These studs are positioned in rows on both the top and bottom of the hands. They created a somewhat solid metal barrier. Because the gloves have multiple steel studs rather than a large plate of metal, the gear stays flexible enough for comfortable use. 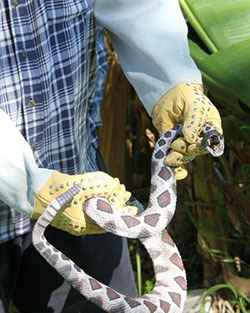 Made for handling a variety of different animals, the gloves from Sinnayeo can keep you safe from smaller snakes. It’s made from durable leather. The thumb and wrist gauntlet are made from a softer flexible leather while the hands and other fingers are covered in hard leather. This combination keeps the gloves comfortable and safe. Kevlar thread is used to join the various panels of leather. The tough thread is resistant to tearing, ensuring that the gloves will stay strong for many years to come. 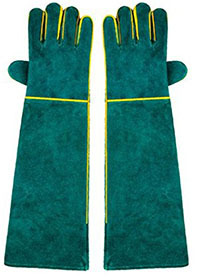 The gloves are available in multiple sizes and have bright yellow accents for improved visibility. Before choosing any standard pair of snake bite-proof gloves, there are a number of things to consider. Gloves utilize a variety of different materials and features to keep you safe, but their effectiveness depends entirely on how they’re used and on the particular snake species being handled. The materials are what makes a pair of gloves snake bite-proof. 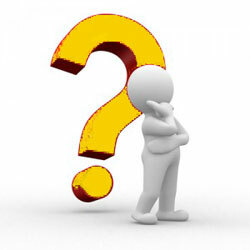 Manufacturers may use natural materials, synthetic materials, or a combination of both. The specific material used determines how effective it is against bites. Not only that but the material can affect the gloves’ overall comfort, flexibility, and traction, which is an important consideration if you plan on using additional handling gear like tongs or a hook. Leather is one of the most common materials used. It’s naturally very tough and resistant to punctures. Typically made from cowhide, the material can be treated to be very tough. Manufacturers can use a variety of thicknesses to manipulate the softness of the leather. Thin leather is flexible and is best suited for smaller snakes while thick leather is great for larger snakes. Either way, leather will gradually soften over time, so it’s best to get replacements every so often. Kevlar is a synthetic fabric known for its very high tensile strength. It’s very light and is used for a variety of products, including protective vests. Kevlar is a great material for larger or more aggressive snakes. It offers more protection than leather alone. Because of this, it’s often used alongside the natural material. Due to its toughness, it’s not uncommon for snakes to injure themselves by biting Kevlar gloves. Many manufacturers have created unique synthetic materials that offer superior protection. These materials are carefully crafted to provide abrasive protection. They often utilize a scale or armor-like design. While strong against tears and small teeth, they can’t prevent needles or large teeth from getting through alone. To be effective, multiple layers of the same fabric have to be stacked. Alternatively, some glove makers combine it with leather or Kevlar. Length is another big thing to consider when choosing gloves. While most gloves provide ample protection to the hand and wrist, you may need something a bit longer. Longer snakes can easily reach a forearm, especially if they’re prone to striking. Many gloves are available with lengthy gauntlets to cover parts of the forearm while others can provide coverage up to the elbow and bicep. With the right pair of snake bite-proof gloves, you can handle the creature with confidence. These specially-designed gloves are made from tough materials that can manage a bit of wear and tear. Rather than the typical woven material that lets anything through, these materials create a tough barrier between your hand and the sharp fangs of an aggressive snake.